We’ve been planting for a few weeks now. Just added some zucchini, lemon cucumbers, more tomatoes, and some pumpkin seedlings that my dad gave me. Had to zap the zucchini and the cucumbers with organic bug spray (sounds weird, right? ); hoping it works because I’m tired of my veggies getting eaten. 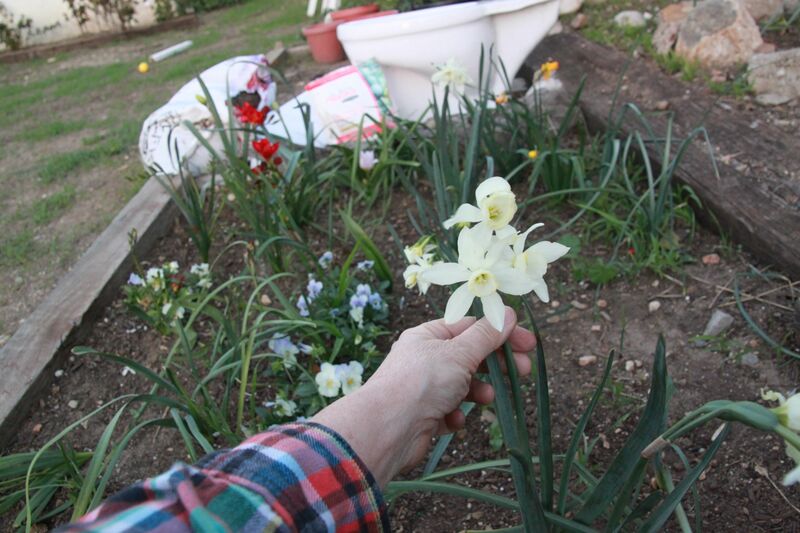 But before I show you the garden, here is my bulb bed – very happy with how it turned out! The iris area the newest up. The daffodils are gone, as are the tulips; the freesia (red, in the foreground) seem to hang around the longest, and are definitely the most fragrant. 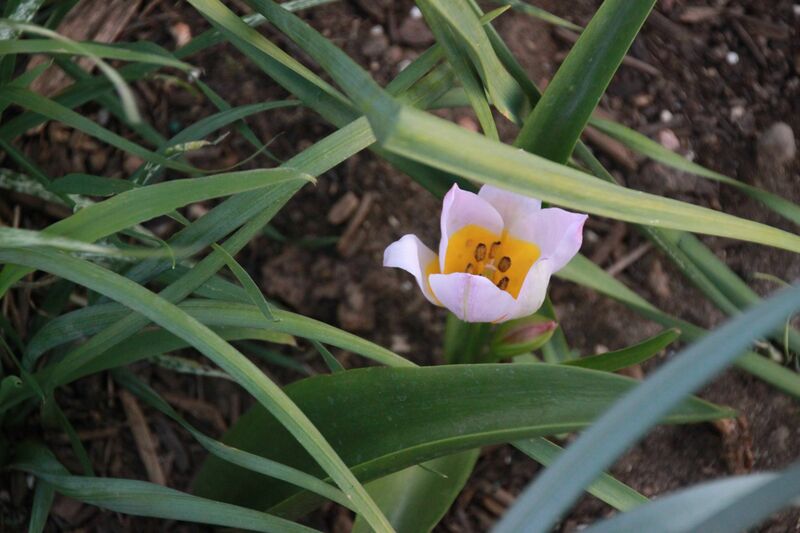 The hubs snuck some dainty tulip bulbs into my bed…pretty, isn’t it? Here, though, is the star of the garden – the first to be picked for consumption, and the first to be done for the year. 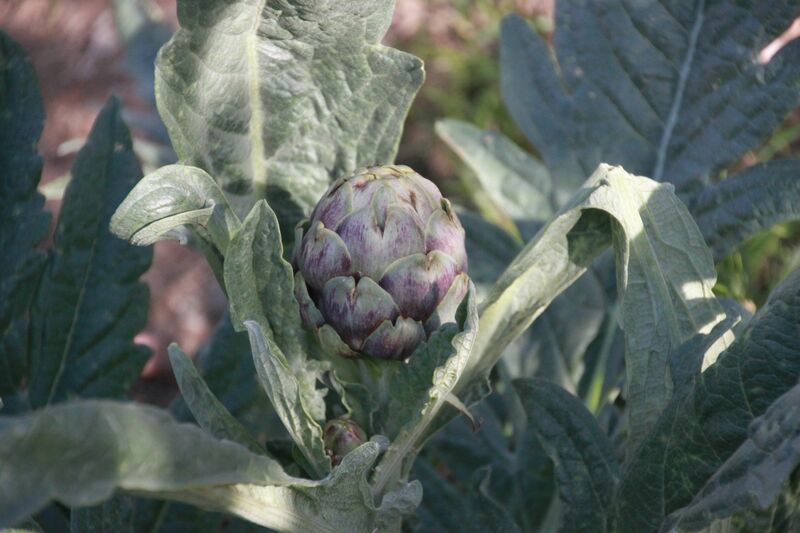 Yep – it’s artichoke season! Below are the pumpkin plants my dad grew from seed. Not giant pumpkins, just regular ones – it’s gonna be interesting to see if we actually get some pumpkins this year! Dad’s pumpkins, planted too close together. Oh well! When they start vining, we’ll train the vines out into the yard. 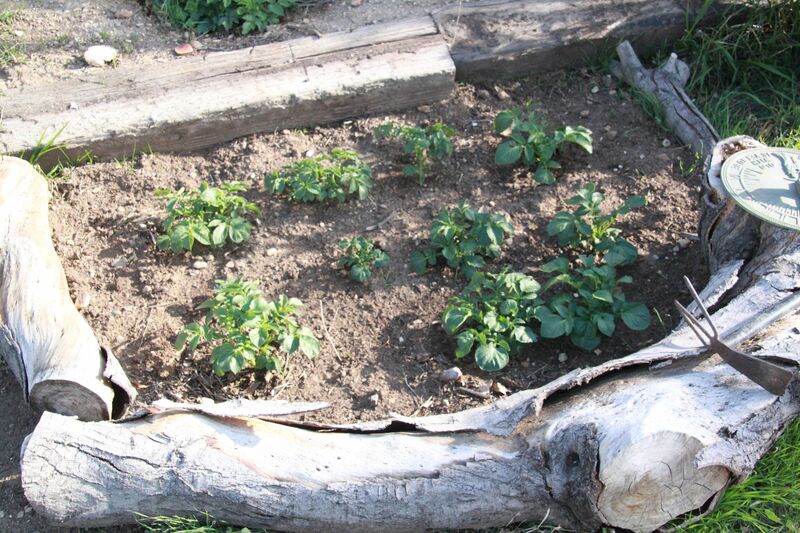 Potatoes are the easiest thing to grow. Once a potato in your pantry (or fridge, or wherever) starts budding, cut it up so each bud gets a chunk of potato, and toss them in the ground, bud side facing up. I planted these about a month ago. Here’s a mixed bed that we planted last fall – kale to the left (the insects leave the kale alone), boysenberry in the back (though Tom tried to dig that out, it’s hard to dig berries out all the way), and beets in the front. 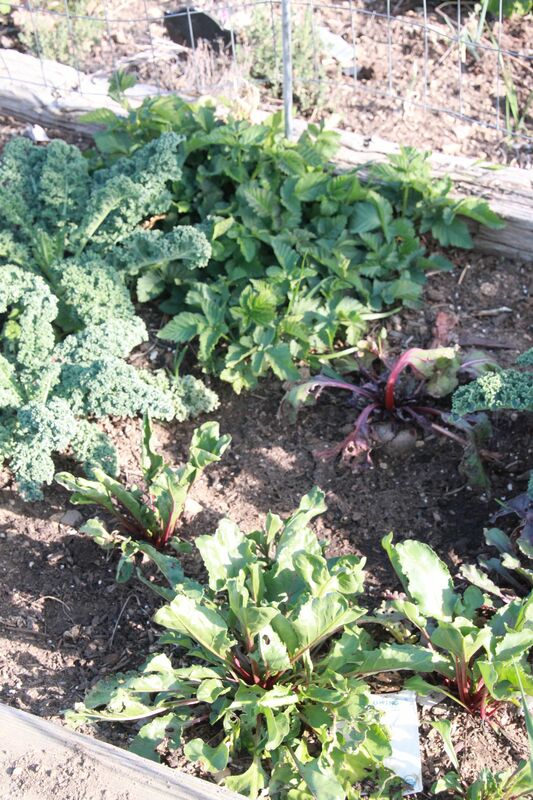 Almost time to pull the beets, the berries haven’t started flowering yet, and I’m cooking with the kale right now. So, that’s the highlight of the garden. What do you think? I love your comments! If you like the blog, I’d love to have you follow me (because that way, I’ll be much more disciplined about putting blogs up). 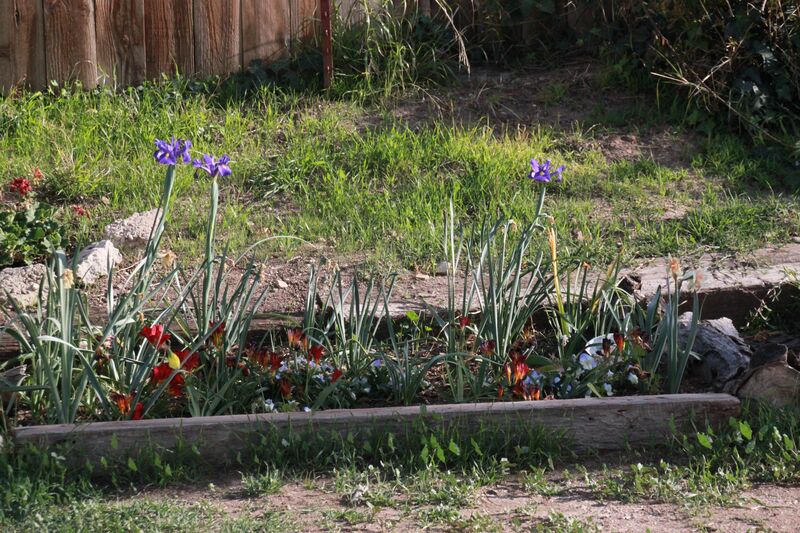 This entry was posted in My Garden and tagged artichokes, bulbs, Christine Ashworth, kale, my garden, potatoes, pumpkins. Bookmark the permalink. Gorgeous garden, Christine. Get yourself a few lawn mowers and the Ashworths will be zombie free when the apocalypse strikes. (And everything I know about the zombie apocalypse I learned from the video game “Plants vs. Zombies,” so, if you don’t know it, just trust me, plants…and lots of ’em…are important)! Oh SAM! I LOVE Plants vs Zombies!!! 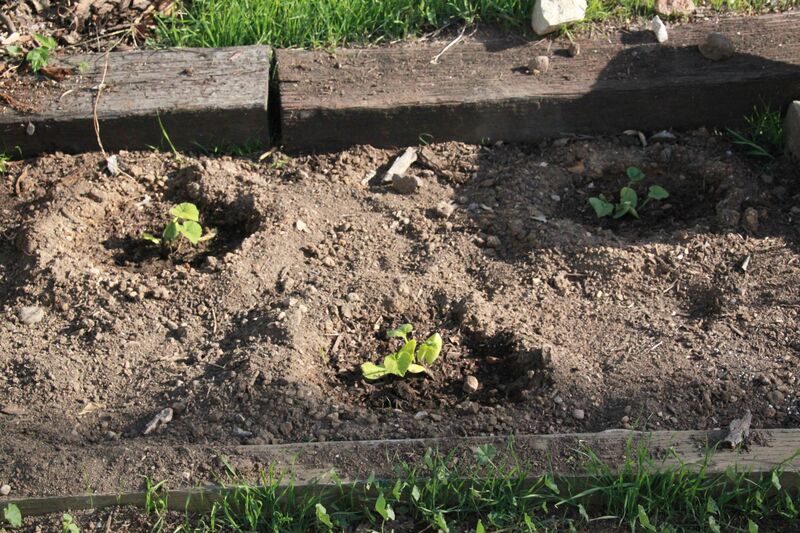 My sunflowers haven’t sprouted yet though…HUGS!!! Love the garden and totally have missed the “excitement” of zombies. I am missing the zombie-as-entertainment gene. My head cannot wrap around it at all. Sigh. I feel as though I am admitting that I don’t like puppies, kittens and babies. On the other hand, I love vegetables and love your garden Christine. These are the pictures that make me want to move out of my apartment and into a house. The only problem is that I love my current rent more than I want to love a garden. I live vicariously through yours. Maria, remind me to let you play plants vs zombies when we’re in San Antonio! Teresa, I don’t know – you might give artichokes a try if they have them in your nursery. They are damned hard to kill – every time I think I’ve killed one, it comes back the next year – so here, they aren’t annuals at all. I’ve had many of them for more than five years, and just a couple are on their second year. You never know!